What do you think of this O-Cedar Robotic Floor Cleaner? 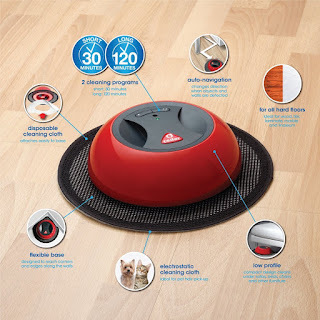 The innovative O-Duster Robotic Floor Cleaner makes your life easier with faster and simpler floor dusting. The O-Duster’s auto-navigation feature effectively covers all your hard floor surfaces, giving you time for the rest of your to-do list. Its flexible base is designed to reach into corners and along edges while the compact design slips under sofas, beds and other furniture to grab dust and pet hair. BONUS QUESTION! Who has the best price?